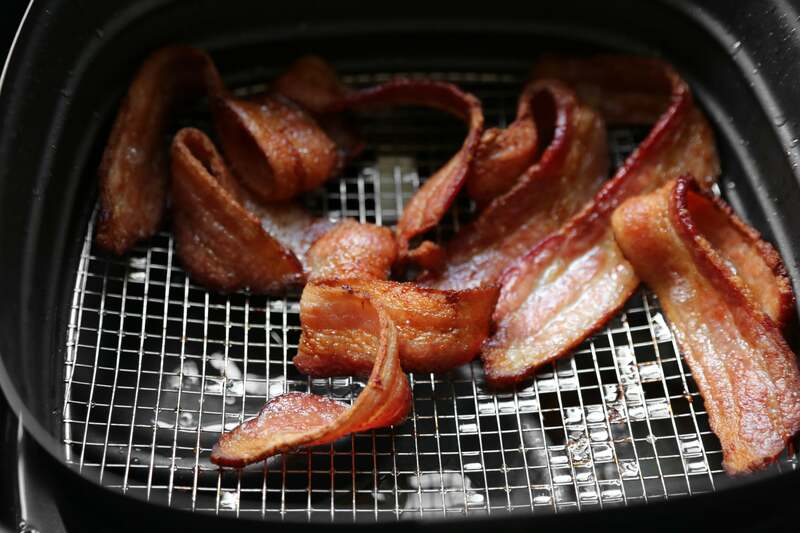 Bacon is traditionally cooked in an oven, over the stovetop, or in a microwave, but what happens when you air-fry it? Air-what, you may be thinking? 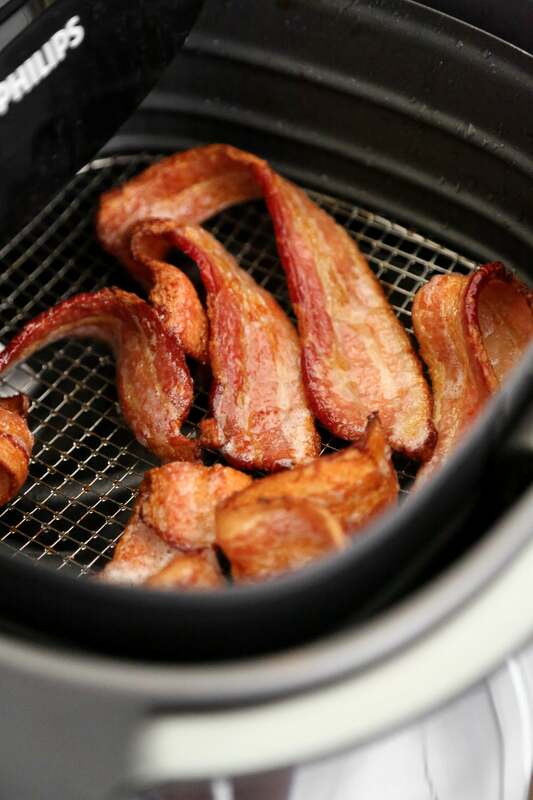 Air-frying is exactly as the name sounds. An appliance about the size of a slow cooker contains a drawer with a metal mesh bottom for the food. 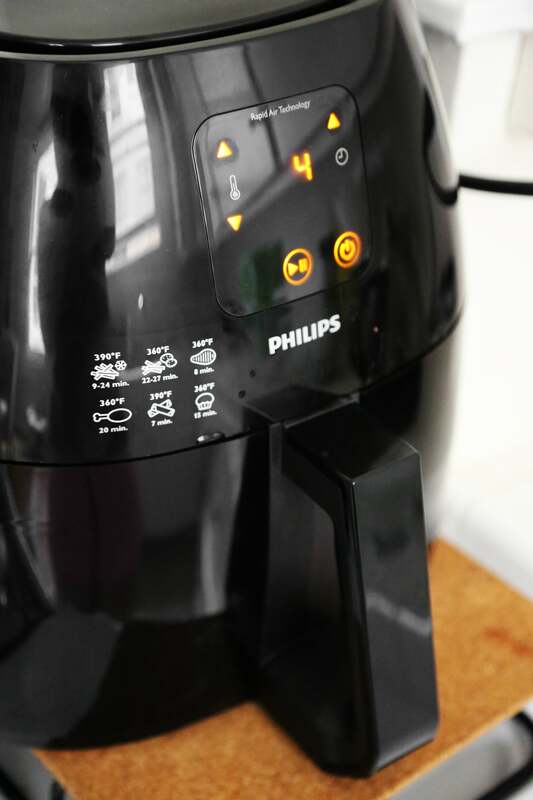 The appliance blows hot, dry air on food to fry it with little to no oil. This trend took 2016 by storm thanks to celebrity endorsements from Gordon Ramsay, Paula Deen, and Oprah Winfrey, so what's the dang fuss all about? 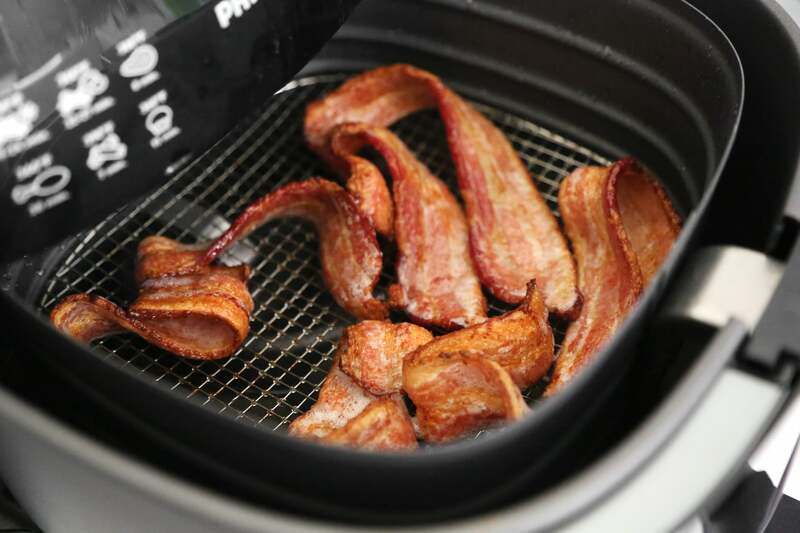 I busted out a Philips Digital Airfryer and a package of bacon to find out. Having no clue how to air-fry, I watched a YouTube video on how to air-fry bacon and followed these instructions. However, I ended up with steamed bacon once the cook time was complete. It resembled deli ham more than bacon, and the fat from the bacon turned translucent and gelatinous. Perhaps this is the preferred method to cook bacon in Europe, but for me, I like my bacon crispy. So I cranked up the heat and kept cooking, shaking the basket occasionally and tripling the cook time, until I ended up with perfectly caramelized strips. I'm talking evenly cooked with no burn spots. Bacon never looked better. But looks can be deceiving; the taste test would reveal the bacon's true tastiness or not. 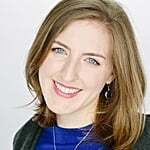 Remarkably, the bacon had a thin, crisp exterior that yielded to a fatty, chewy interior. I've never had bacon quite like this. The bacon also retained its size prior to cooking and did not shrink at all. The cleanup was a breeze too. I poured the extra bacon grease into a dish for later (it too was pure fat with no black char bits that you find when cooking bacon in an oven or on a stovetop) and proceeded to scrub down the drawer, which proved to be an easy feat. Feeling confident about my air-frying skills, I proceeded to attempt apple chips and failed horribly. I mean, the apple chips burned and stuck into every crevice of the grid bottom. It was a nightmare to clean up with no reward of apple chips at the end. I know there's a learning curve to a new cooking device, so I'll try again. I'm dying to learn how to make french fries and fried chicken. Those will be my next attempts!